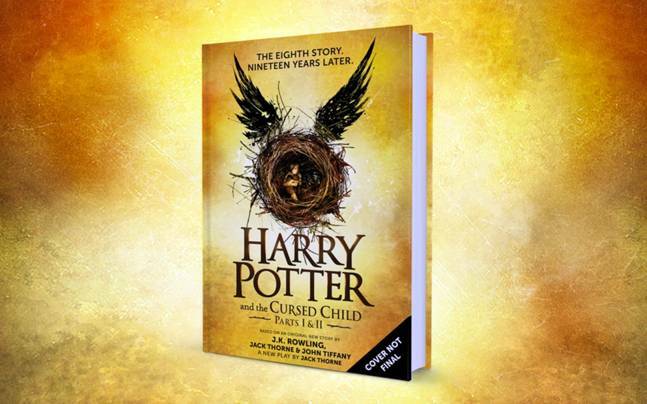 Last weekend, the much anticipated "Harry Potter and the Cursed Child" was finally released! Just as the new play Officially opened in London, Potterheads around the world were able to get their hands on the eighth, and final installment to Harry's story. Our review will be brief and vague, as we don't want to say too much and spoil any part of the new book. We weren't able to start reading it immediately like most die hard fans, but we did spend the last 24 hours reading non-stop! I was hesitant on how the book would read, being that it is the script from the London play, but it was perfect. I completely forgot I was reading a play and the story flowed beautifully. The best part of it all, the new book was everything we wanted it to be and more! Picking up 19 years later, exactly where we left Harry at Platform 9 3/4, Harry, Ginny, Ron & Hermione send their children off to Hogwarts. The new story is as much about the relationships of our former heroes as it is about their children and their relationships they build. Much of the story follows Harry's son, Albus and Draco Malfoy's son Scorpius' relationship as they start their first year at Hogwarts. The story quickly takes us through their first several years at Hogwarts, as written in stage direction and showing the passing of time in just a matter of pages, and Hogwarts send offs. The father son relationships between Harry & Albus, as well as Draco and Scorpius, become more and more strained as the years go on, as Albus and Scorpius never wanted to live in their famous fathers shadows and mishaps. A friendship between Albus and Scorpius grows as the story goes on, creating wonderful conflict and driving the ever-growing story. Following the journey of all of the characters, the Cursed Child returns us to our favorite places in Hogwarts, Hogsmeade, the Ministry of Magic and so much more. Throughout the book, we manage to watch our favorite characters continue to grow as adults and try to adjust to life as an 9-5 working wizard. The relationships we see grow, as well as develop, are everything we've grown to love with the Harry Potter franchise. New challenges face each character, and the wizarding world faces new trials that come it's way. The Curse Child keeps you on the edge of your seat and keeps you reading just like every one of it's predecessors has done. We promised spoiler free, and we gave you the most vague, spoiler free review we could. So much happens in this book that if we didn't keep it vague, we would have spoiled something in the story. I loved this book! I wish there was more to read. I can't wait to see the play in London when I'm there in 2017. Go out and buy "Harry Potter and the Cursed Child" and spend the next 24 hours diving back into the Wizard World you've grown to love it. You will enjoy every minute of it and want to read it again and again!